We are a Malaysian organisation affiliated with WWF (World Wide Fund for Nature), the international conservation organisation. Established as a national conservation trust on 13 January 1972, WWF-Malaysia began as a humble two person-organisation. Today, we have close to 200 people working for us – from Kedah to Sabah. Also known as Tabung Alam Malaysia, we are governed by a Board of Trustees. Besides our headquarters in Petaling Jaya, Selangor, we have programme offices in Kota Kinabalu, Sabah and Kuching, Sarawak as well as site offices in Fraser’s Hill, Malacca, Jeli and Stong in Kelantan, Ma’ Daerah and Setiu in Terengganu. Our early work focused on scientific research of wildlife and important natural habitats. This work later expanded to the management of protected areas. 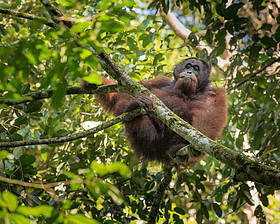 Today, WWF-Malaysia’s work covers the broader issues of the natural environment, incorporating such aspects as policy work, environmental education, public awareness and campaigns. ...paving the way towards a future where humans live in harmony with nature.